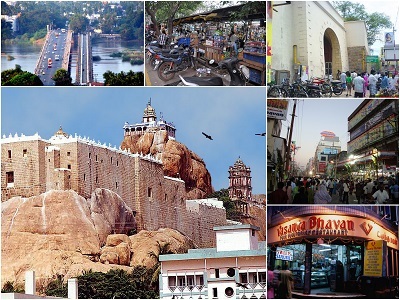 Tiruchirappalli, the rock fort city which is fondly called as Trichy or Tiruchi is a significant urban centre located in the southern state of Tamil Nadu. Trichy is looked at as an important industrial base in South India as the city is the official address of a lot of landmark companies Bharat Heavy Electricals Limited, Ordnance Factory Tiruchirapalli, Heavy Alloy Penetrator Project, Cethar Vessels, Dalmia Cements and many other giant companies. The city is also considered as the fourth most prominent municipal corporation and the fourth most magnanimous urban agglomeration in Tamil Nadu. Trichy is also famous for its countless tourist options as the city offers a wide range of sightseeing options, shopping options, entertainment options and many other things to do in Trichy. Find below some of the things to do in Trichy options, which will come convenient for people who plan to visit the adorable city of Trichy. The city of Trichy is always seen as a perfect tourist destination for its infinite sightseeing options. The city is widely recognized for its historic religious sites like Rockfort Ucchi Pillayar Temple, Srirangam Sri Ranganathaswamy Temple, Natthersa Mosque, Woraiyur Arulmigu Vekkaliamman Temple, Church of Our Lady of Lourdes, Vayalur Sri Subramaniya Swamy Temple, Thiruvanaikaval Jambukeswarar Temple, Samyapuram Arulmigu Mariamman Temple, Chowk Maidan Masjid, Golden Rock Saint Joseph Church, Bhikshandar Kovil or Uthamar Kovil, Sri Kallukuzi Anjaneya Swami Temple, Kajamalai Dargah, Teppakulam Saint John's Church and many other renowned historic sites. Trichy is a tourist destination that attracts visitors from all over the world irrespective of times of a year. The list of tourist attractions of Trichy is not limited with religious sites but the city also features a lot of picnic spots that come as a boon for people who are tired of their mundane lifestyle and deliberately looking for an escape. Some of the most popular picnic spots of Trichy include Mukkombu, Puliancholai, Kallanai Dam or Grand Anicut, Ponnaniyaru Dam, Pachamalai Hills and so on. A trip to Trichy city will not be complete without a visit to these picnic spots as each of the spots is unique in their own way, and they never cease to amaze the visitors. Trichy is a city that is always regarded as a significant business centre for its historic and popular shopping streets like Chinnakadai Veedhi, Singara Thope, Teppakulam Burma Bazaar and the never ending list of giant textile outlets scattered all over this beautiful city. As a matter of fact, Trichy is a city that is preferred even by the people of suburban areas of the city for shopping and large number of people from outskirts of Trichy visit the city, especially the Chinnakadai Veedhi for their shopping needs. Furthermore, people from the nearby districts like Perambalur, Namakkal and Thanjavur treat the city of Trichy as a shopping destination and oftentimes opt for the city for its close proximity. Some of the most popular shopping points of Trichy include the world famous Trichy Sarathas, Mangal and Mangal, Sri Thaila Silks, Lakshmi Silks and Readymades, Chennai Silks, Mangalam Towers, FSM or Femina Shopping Mall, Shopping streets like Singara Thope, Burma Bazaar, Chatram Bus Stand Complex and many other options. Although Trichy may not be like Coimbatore or Chennai but it is a reality that the city will never betray you in terms of shopping options. The rock fort city of Trichy cannot be fully explored without tasting the range of foods the city has to offer. Even drinking water in Trichy comes with high grandness as the supplied water that is, Cauvery water is regarded as one of the holiest waters in the nation. People from all over the world visit the city primarily to have a dip in the holy water of River Kaveri. Anyhow, coming back to the context, Trichy does not feature a very own cuisine type but the city principally follows Tamil cuisine. Trichy is famous for its numerous celebrated restaurants that not only serve authentic Tamil cuisine but also a wide variety of culinary art choices. Some of the popular restaurants in the city include Hotel Vasanta Bhavan, Sangeetha’s Restaurant, Sangeetha’s Restaurant, Sri Krishnas Garden Restaurant, Mr & Mrs Idly, Anjappar Chettinad Indian Restaurant, Kannappa Chettinad Restaurant, Kannappa Chettinad Restaurant, Banana Leaf Restaurant, Hotel Raja Garden, Marry Brown Family Restaurant, Geethanjali Restaurant. Trichy city also houses a lot of fast food chains to cater the needs of the youth population. Some of them are Dominos Pizza, Dobbelstein Bakers & Pizzas, Pizza Cottage, Kaycees, and Pizza Corner and so on. With a wide range of things to do in Trichy options like sightseeing, shopping, eating out and various other entertainment options, the rock fort city is likely to keep the visitors engaged throughout their visit. What's holding you back, plan your trip, book your tickets, pack your bags, come and explore the blissful city of Trichy. Click here for vegetarian restaurants in Trichy and non-vegetarian restaurants in Trichy.